This lesson looks at various woodlot features and their importance to outdoor recreation. It also deals with recreation in wood production areas. As you apply this information to your own woodlot, you may have a better idea of what activities are possible in your situation. The concept of zoning areas is introduced at the end of the lesson. A variety of features affect your woodlot recreation potential. They include woodlot size, forest stages, tree species, natural areas, trails, terrain, waterways and attractiveness. Some features can be changed or modified to enhance recreation. Some of these changes are long term and will benefit the next generation but some may improve your present recreation potential. Backwoods cabin, picnic area, camping, short trail network, nature study, photography, skating, swimming - more site specific activities. With heavy use, undergrowth may get trampled and wildlife disturbed. It may be necessary to stay on trails to prevent excessive damage to vegetation. Longer trail networks are possible to link sites of special interest. Above uses and more. Having separate areas for recreation, forestry operations, or wildlife may be difficult due to limited size. More overlapping use may be necessary. Use can sometimes be separated by season (for example hiking in summer, thinning in winter). More extensive trail network possible such as a cloverleaf design. The woodlot can be zoned for various uses but some overlapping may still be required. For more on zoning, see page 19 at the end of this lesson. Longer routes can be developed for horse riding, ATV'S, snowmobiling, skiing, and other activities that cover more distance. This size can provide privacy for different groups using the woodlot at the same time. Primary use of some areas for recreation, silviculture or wildlife is possible. Back country camping, wilderness recreation, longer overnight trips. Possible to manage for intensive outdoor recreation, forestry, wilderness areas and other woodlot values. Back country camping on a large woodlot. Woodlot size can influence your options although size is not the only factor. Trade-offs are more likely on smaller lots. If the woodlot is too small for your goals, you may be able to buy adjacent property. Or you may try partnering with your neighbors as discussed in Chapter Two. Forest openings and more mature forest generally allow easier access and so provide more area for recreation. Many activities may be difficult in pole timber and dense growth areas. It may be necessary to cut small forest openings and trails if few exist. Thinning may also be helpful but is more labour intensive. 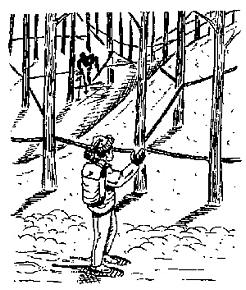 More specific silviculture techniques for improving recreation in dense and mature forest are provided later in the lesson. Forest fires, blowdown and insect infestation are three other natural forest stages that affect outdoor recreation. A charred forest does not make for very pleasant walking or wildlife viewing. This will change after a couple of years as new growth comes in. Winter activities may be more appealing when the burnt duff and trees are covered with snow. Extensive blowdown can greatly limit recreational potential in an area. It may be necessary to cut trails through it or go around it. Insect infestation can kill or weaken trees making them a hazard for people passing by. You may want to cut trees along trails or cut the infested area creating a forest opening. A diversity of plant species improves conditions making wildlife viewing and nature study more interesting. Planting single species provides limited wildlife habitat but other species will usually invade a site to improve the mix. Planting a variety of species or doing a selection cut can increase diversity. Make sure the species selected for planting match the site. Blowdown from windstorms may block trails. The amount of natural looking area on your woodlot may affect your recreational options. Wilderness camping for many is not appealing in a 50 ha (123.5 acre) woodlot that has been clearcut. Wildlife viewing may be limited by lack of natural habitat. While many recreational activities are still possible in wood producing areas, most people prefer a certain amount of natural area or at least natural-looking area for recreational activities. Stands can be left to develop naturally to provide a better mix of natural and treated areas. Outdoor recreation activities can be safer and easier using trails especially if the forest is dense and full of obstacles. Places seem closer with trails. Trails can include extraction trails, old roads, foot paths, abandoned railway lines, boundary lines and animal trails. Creating new trails may be necessary if none exist. Lesson Four has information on trail construction. Most woodlots have some variety of terrain which makes outdoor recreation more interesting. If your woodlot is very flat, it may limit the adventurous aspect of certain activities such as skiing and mountain biking. Jumps and obstacle courses may provide a challenge. On a lot that is very steep, hiking and other activities may be difficult. Switchback trails may help. If a site is nearly vertical, consider rock climbing. Waterways increase your potential for fishing, swimming, skating, canoeing, wildlife viewing and increases visual interest. If natural waterways are not present, consider building a pond. It can also be used as a water source in case of fire. See Lesson Four for more details on ponds. The beauty of a woodlot affects our recreational experience. People can be greatly attached to certain sites on their land. This can be very subjective. Many people find a mature forest with large trees attractive. Others have a favourite tree species or like a variety of species. Consider the diversity your woodlot has in each of the eight features described above. Give each feature a value of one for high diversity, two for moderate diversity and three for low diversity. Mark the number next to each feature in the list below. Remember that these features can be modified to benefit recreation. Recreational activities often take place in wood production areas because of an existing network of roads, trails and openings. Each forest treatment has its own limits and opportunities for outdoor recreation. Shelterwoods, selection cuts, clearcuts, plantations, Christmas tree plantations, maple bushes, weedings, thinnings, and extraction roads and trails are explored below. With all of these treatments, safety is a concern when crews are cutting and heavy equipment is in use. You may want to limit recreational use and post signs when operations are active. A shelterwood treatment involves thinning an even-aged mature stand two or three times over 5-20 years. The overstory opens up with each cut promoting seedling growth underneath. Visibility is improved, a plus for recreationalists. This is an attractive forest with a high canopy. Movement may be easy at first but dense new growth increasingly makes movement more difficult than it was before the treatment. Care should be taken not to damage new seedlings once they have started. For these reasons, recreation, especially motorized activities, may need to be limited to trails in a shelterwood. Slash on trails (branches left from cutting) and new growth should be removed from trails. The final cut of a shelterwood removes the canopy leaving a new forest with well-established, dense new growth. Recreational opportunities change because the new forest is younger and provides less shelter. This treatment also results in a visually attractive forest but this one has constant cover and several layers or canopies. Cutting is done every 5-20 years to create or maintain an uneven-aged forest. It is possible but not necessarily easy to move about in a selection cut depending on the species and stand diversity. Young regeneration is not as dense as in a shelterwood and is thinned frequently. A selection cut requires an extensive road and trail network that benefits most types of recreation. Large clear cuts are often considered unattractive for recreation although they can benefit specific wildlife species and provide a view. Keeping cuts smaller will provide more diversity and interest for the recreationalist. A study in New Hampshire found that people preferred the looks of medium sized cuts as opposed to very large or very small. Clear cuts create more slash at one time than other forest treatments. Slash and stumps result in hazards for most forms of recreation. When planning a clear cut, consider the effect it will have on existing trails and other recreational opportunities. Avoid putting slash on existing trails. A ski trip along a favourite trail can come to a sudden end when you run into a big slash pile. On the other hand, slash can also be used to shut down a trail no longer needed. Eventually smaller branches will break down but larger ones will remain for many years. If the pile is small enough, you may want to clear a new route through it. An alternative is to redesign your route to make use of the extraction road. It is important in a plantation not to damage the young trees. Recreational activities that could result in damage may need to be restricted to existing trails. When crews are planting, have them leave trails for recreation. Slash may still be a hazard in young plantations until it decomposes. As trees mature, activities off-trail may be difficult due to the density of the vegetation. Although a Christmas tree plantation may not offer a lot of visual diversity, there is something delightful about the shape of the sheared trees. Christmas tree stands vary greatly in their density. Some may allow easy passage for a variety of recreational activities while others may be too closely spaced. Care is needed not to break branches or damage seedlings. Broken branches can ruin the saleability of a tree. Most christmas tree lots are very suitable for recreation as they have good trail systems. Tractor trails are usually 60 - 90 meters (196-295 feet) apart. Those lots are also good for viewing wildlife such as deer hawks, hare and grouse. It is important to ask permission if you want to hunt on or near a Christmas tree lot to ensure that workers are not working in the area at that time. Weeding may be done in a clear cut control plants that interfere with the growth of desired tree species. Weeding is done with chemical sprays using back pack tanks or by air, or by air, or by manual cutting. Signs are usually posted when an area is going to be chemically sprayed. After spraying, it is recommended not to use the area for seven days. recreationalists are also restricted from the area when it is being manually weeded. Otherwise, the considerations for clearcuts and plantations may be applied. A precommercial thinning or PCT is thinning immature trees from a stand generally less than 6 m (20 feet) to promote growth remaining trees. Although the forest becomes less dense, the cut trees are left on site creating difficulty underfoot. A commercial thinning removes at least 30 per cent of trees in a stand over 15 cm (5.8 inch) diameter (dbh). Slash may be a deterrent to reaction. Extraction roads may be used and possibly connected to other trails. The most important consideration is to keep existing trails clear of slash. A maple bush or sugar bush may seem well suited to recreation. Here you have an attractive, mature maple forest with large, crowned trees that is cleared below. Unfortunately for the recreationalist, this forest is a maze of waist height plastic lines! Skiing in a maple bush may damage lines and skiers. Activities like hiking and snowshoeing can be done without damage to the lines. In fact, maple bush operators use snowshoes when they are tapping out the trees in March. Skiing can be very challenging unless you are highly skilled. Again you may want to restrict certain activities to existing trails. Sugar woods usually have a good trail network as well to allow for intense management. Generally loop roads and trails that are not too straight are more interesting for recreation. It may be possible to incorporate sections of your extraction trails into ones more suited for recreation or you may need to cut new ones. Avoid making ruts with harvesting equipment since they can interfere with certain recreational activities and wash out trails. They can also lead to sediment in waterway and affect the wildlife that live there. If your woodlot has preexisting ruts, these may need to be repaired. You may need to make new routes through less sensitive areas or use some type of bridge if drainage is a problem (See Lesson Four). This lesson has examined what outdoor activities are possible in term of woodlot features and wood production areas. Now you can apply this information to your woodlot. Have your woodlot map and list of recreational goals and objectives at hand. Consider how the following woodlot features affect your outdoor recreational plan: woodlot size, forest stages, tree species, natural areas, trails, terrain, waterways, and attractiveness. For example: How does you woodlot size affect your plan? Do this for each remaining feature. Using your woodlot map should be helpful. Make changes to your list that are necessary. You may not be able to accommodate all of your goals and objectives. What can you do on your woodlot to improve these features for recreation? Look at the wood production areas on your woodlot map. Can these commercial treatments co-exist with your recreational plan? How will each area be changing in the next 20 years? What changes will you make? For example, will your mature spruce stand be cut in ten years? Will this change your recreation plan for this area? Again make a note of any changes. You now have a list of recreational goals and objective based on what is possible on your woodlot and future changes. The next lesson contains "how to" information. The last part of this lesson on zoning may be useful to you if you are managing you woodlot for many different uses. 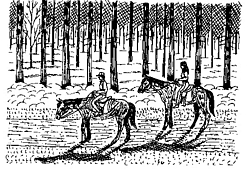 Zoning your woodlot is a more recent practice though some woodlot owners may have been doing it formally for years. It involves dividing your woodlot into zones based on what uses are most important to you in those areas. It also depends on your woodlot features. Zoning areas for single use is generally only possible on a larger woodlot as mentioned before. A zone is managed for one use or for multiple uses like recreation, wildlife and wood production based on order of importance. There are many options. In terms of outdoor recreation, you may decide that a certain zone is to be used only for recreation. A second option is for recreation to be a primary use with wood production as a by-product. A third possibility is for recreation and wood production to be of equal value. Finally recreation may be a by-product of wood production. Zoning may help you zero in on specific sites and possible conflicts. Where conflicting uses occur, you will need to list values in order of importance or choose between them. You may decide to change treatment plans if recreation is a priority. Also remember that the forest is not static and zones will change over time. 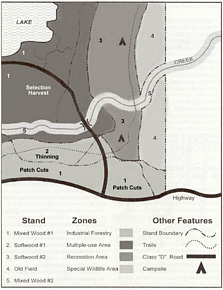 If you have a management plan, your woodlot may be divided into zones already. You may want to try drawing various zoning options on your woodlot map photocopies. If you want to know more about zoning, refer to Seeing the Forest Among the Trees,by forester Herb Hammond, Chapter Five, pages 220-230. In it, he discusses the concept of holistic forest use zones, how to make decisions on zoning and zoning maps.